Can I compost Egg Boxes? - Can I Compost It? Cardboard egg boxes are a great addition to your composter. Don’t add plastic ones of course! Due to their unusual shape, egg boxes are also very good at making sure there is some air in the compost heap, which helps ensure your decomposition takes place aerobically, allowing your organic material to break down as quickly as possible. 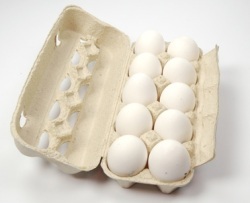 The cardboard of the egg carton itself can be a little slow to break down, so it is a good idea to tear the egg boxes up into smaller chunks and soak them in water for an hour to get things going a bit quicker.